I wasn’t going to do anything on Paradise Palms for a while after our big long series on the 1963 newsletters and William Krisel designs. However, there’s still a mysterious shortage of bank owned homes that are available, and a doozy of a good one popped up in Paradise Palms the other day. 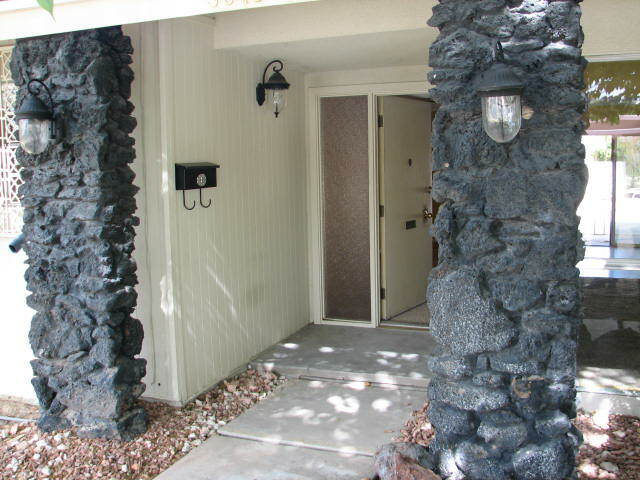 One of the things we learned from the 1963 newsletters as that all the homes on Mohigan, Papago, Hoopa, Omaha and Delaware were unique – one (or a few) of a kind custom homes. This one at 3846 Hoopa Lane, on the corner of Mohigan has always been one of my favorites in the area because of the columns of Lava Rock in the front, and the 36 inch crinkle-cut-pattern front door. 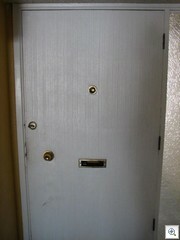 I’d never been inside until yesterday when it came to market as a bank owned foreclosure. I knew the floor plan – and loved it from a similar design on Mohigan that sold last year. 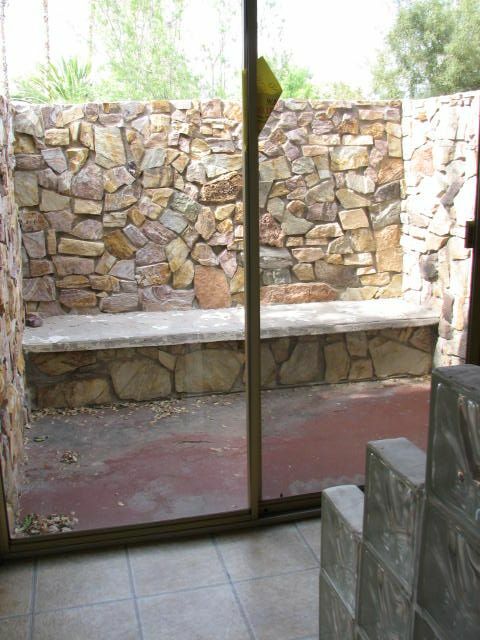 Inside I found a wall of glass and extra wide sliders to the back yard, as well as the sliding glass doors from the dining room to the front of the house. 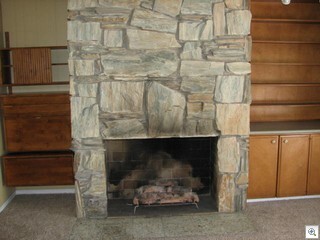 The step down living room features the rock fireplace with terrazo hearth and the lighting soffit/ledge. It’s actually a 2 sided fireplace column, and the family room side of the fireplace is even more dramatic with it’s built in book cases. 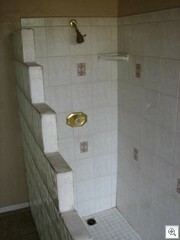 The other great original feature of the house is the step down – sunken shower in the master. 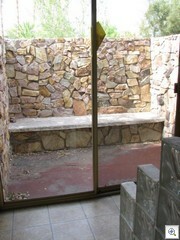 Looking out from the shower you’ll find a private little rock-walled patio space with sliders leading to to it. There’s a few other really cool features, such as the back yard and pool. The house is in remarkably good condition for a bank owned foreclosure. 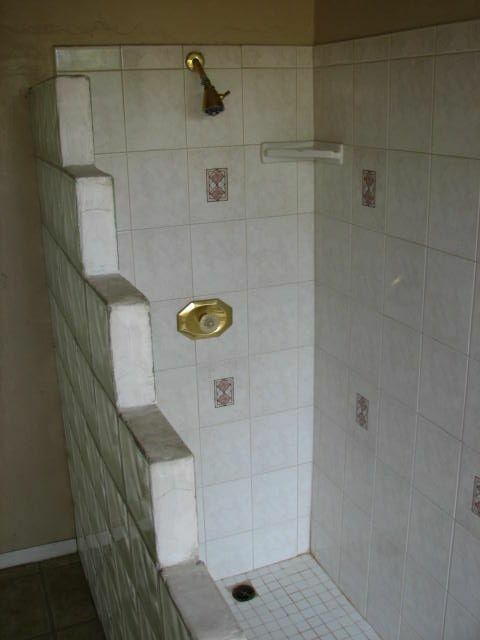 Here’s the MLS pictures, and the amusing comment from the listing agent: “A quaint and mature 3 bedroom”. No one who reads this blog would use the word “quaint” to describe it. 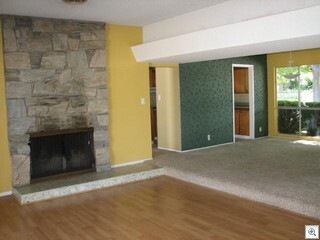 I’d have said: “A fabulous example of a Mid Century Modern Ranch”. 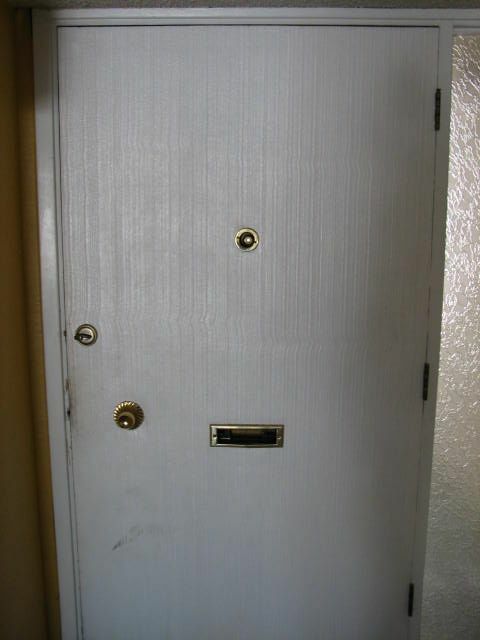 Of course, the bank listed it at a ridiculously low price of $119,900. There’s already multiple offers, but the window is still open this weekend. The best thing is that it’s a Fannie Mae owned home, and NO INVESTOR offers will be considered unless it’s been on the market for more than 30 days. If you’ve been sitting on the fence, there’s a great opportunity here. Give me a call, or tell someone about about it and have them call me.